Sens. 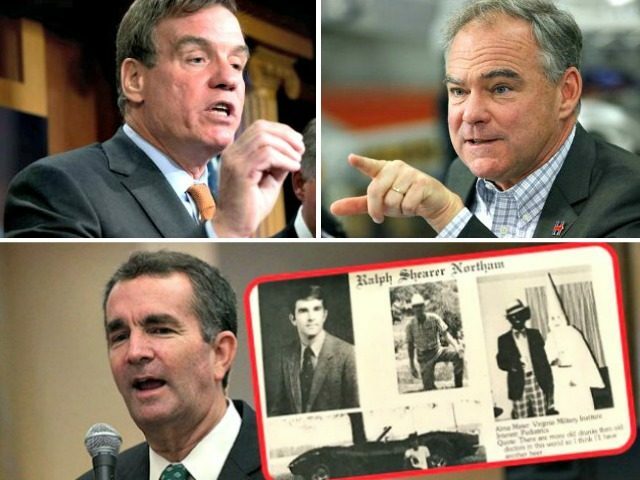 Tim Kaine and Mark Warner (D-VA) issued a statement condemning Gov. Ralph Northam (D-VA) after a photo of him and another individual in blackface and Ku Klux Klan attire resurfaced Friday. Despite calling the photo “racist” and “deeply offensive,” the two Democrat Virginia senators stopped short of calling on Northam to resign. Northam admitted Friday evening that he is in the 1984 medical yearbook photo on his designated page showing one person in blackface and another donning a KKK robe and hood. While Northam conceded that the photo is “clearly racist and offensive,” he did not say which attire he was wearing. “This behavior is not in keeping with who I am today and the values I have fought for throughout my career in the military, in medicine, and in public service. But I want to be clear, I understand how this decision shakes Virginians’ faith in that commitment,” the embattled lawmaker said. The shock photo sparked a flurry of calls from Democrats and Republicans for Northam to step down, while the state’s senators signaled they would leave the decision to the governor himself. The racist photo of Governor Northam’s 1984 yearbook is horrible. This causes pain in a state and a country where centuries of racism have already left an open wound. I hope the Governor–whose career as an Army officer, pediatrician and public official has always manifested a commitment to justice and equality for all–now takes the time to listen to those he has hurt and reflect on how to move forward. “The Governor must now listen to the people and communities he has hurt, and carefully consider what comes next,” he concluded. Democrat presidential candidates Sen. Kamala Harris (D-CA) and Kirsten Gillibrand (D-NY) called on Northam to leave his post. “Leaders are called to a higher standard, and the stain of racism should have no place in the halls of government. The Governor of Virginia should step aside so the public can heal and move forward together,” Harris wrote on Twitter. On Friday, the Virginian-Pilot obtained a copy of the photo from Eastern Virginia Medical School library, where the Virginia Democrat graduated. The website Big League Politics was first to report on the photo.